Posture is the position we habitually hold our bodies while standing, working, moving, sitting or lying down. Postural alignment of the body is maintained by a part of the nervous system that takes over automatic control of many functions in the body, like digestion, breathing and heart function – this is why you do not have to think about them while they operate independent of voluntary action. In a similar way the brain maintains control over slight involuntary contraction of deep postural muscles that are used to help us stand, sit and move without having to think about them. Several major muscle groups, (such as the trapezius, psoas, abdominal, erector spinae and hamstrings) are critically important in maintaining good posture while standing. The tendons and ligaments hold the skeleton together, but it is the postural muscles that maintain proper posture and prevent gravity from falling down. When these muscles are not holding us together for we have bad posture that leads to low back pain and other structural problems. Good posture is a balanced posture that reduces stress on the body; it requires a minimum effort to maintain and therefore tends to be easy and promotes a sense of relaxation and well-being. If you have correct posture your body is in good alignment with itself and functions smoothly and almost effortlessly. Proper posture is the correct alignment of all body parts for the activity being performed while being supported by the least amount of muscle tone. While standing, the body weight should be evenly distributed across the balls of feet and the heels. From the front, while standing, your posture should be balanced so that a vertical line that passes through the tip of your nose will pass through the belly button and between your knees, and your eyes, ears, shoulders and hips are level and on a horizontal plane. From the side, while standing, your posture should be balanced so that a vertical line that passes through the ear will pass through the shoulder, knee and hip joints, while your eyes look straight ahead. In addition, for good posture it is normal to have three natural curves in the spine – the concave (forward) curve of the neck from base of your head to your shoulders, the convex (backward) curve of the upper back from the shoulders to the lower chest, and the concave (forward) curve of the lower back. These three curves balance and offset each other nicely to give flexibility and spring to the spine, and should never be flat or held in a rigid state. 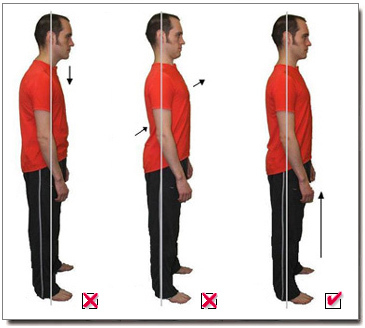 From the picture you will be reminded that bad standing posture looks like you are slumping, and that exaggerated “chin in and chest out” posture is unnatural and will fatigue the body quickly. Proper posture does not require the body to be kept in a rigid and unnatural position, or for the spinal column to be kept totally flat – like in the classic military ram-rod posture. If the way you are holding your body feels fatiguing and abnormal as you try to make your posture better then you are probably doing something wrong. You might be flattening the spine even though it should have a total of three curves from top to bottom, or you might be straining your muscles by holding yourself in an unnatural way. This is not good for the body and leads often leads to even worse posture since no one can continue to maintain these stressful changes for very long. It should feel almost effortless to hold the body normally while improving posture in the right way. Poor posture is stressful and imbalanced alignment and use of the body caused by chronic contraction and shortening of postural muscles. When this happens the contraction requires that other muscles must abnormally lengthen to compensate. Faulty posture can be caused by, as well as perpetuate, excessive strain on those muscles most responsible for posture. Common examples of faulty posture are a forward head posture in which the neck and head are not balanced over the shoulders but are held away from the chest, or one hip held higher than the other by placing a majority of body weight on one leg while the trunk is bent to that same side. Many of these postural stresses begin as habits but soon become more permanent as the muscles, tendons and ligaments adapt to the imbalanced posture, and so poor posture becomes a habit. If your body is not pain-free and relaxed, if you feel tight and stressed across your neck and shoulders, if you do not have the ability to stretch and move as far or as easily as you once did, it is probably because you have bad posture. Many factors can be at play at the same time contributing to poor posture, such as physical and emotional stress, poorly designed work environment or equipment, congenital malformation of the skeleton, old injuries, weak or overly tight postural muscles, obesity, pregnancy and high-heeled shoes. There are different factors which can impact on posture and they include occupational activities and biomechanical factors such as the force and repetition of work being done. Risk factors for poor posture also include psychosocial factors such as job stress and strain. Workers who have higher job stress are more likely to develop neck and shoulder symptoms. Here is a simple and direct method I taught at acupuncture seminars for years that will quickly change your posture you can use while sitting and standing, as well as any other situation in which the hands are not being used. It can be done anywhere and at anytime without much thought or effort. You will be amazed how to change your posture in this fundamental way. When you stand or walk – turn your palms forward in the direction you are facing. When you sit – turn your palms up toward the ceiling. Whenever you are sitting while doing something that does not require the use of your hands, turn them so that they’re palm-side up, by either resting them on the upper thighs or wherever it is comfortable. Whenever you are standing or walking with your hands free, allow your arms to relax as they hand at your sides, as you turn your palms forward in the same direction your body is facing. You will notice the picture, above, shows someone sitting in a way that is commonly associated with meditation and yoga. Since few of us follow either of these two Eastern disciplines, the forward or upward hand position is a simple way to benefit from them. In our modern society we spend most of our day tense and drawing ourselves downward and inward, perhaps as a defensive measure. This simple method to change the position of the palms reverses that tendency by rapidly making subtle changes in the posture to uplift and expand the chest. Once that is done, many other postural changes take place rapidly. 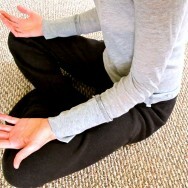 People who try this method for only a day or two report feeling more tranquil and rested; they have a sense that they are sitting up and standing straighter, no longer slumping or hunched forward and down; the shoulders tend to roll back while the chest feels like it is being lifted up and opened. I have never heard of anyone who was disappointed with the results of using this simple method of changing posture. By the end of the second week you will be hooked on how this technique makes you feel and how your posture has improved and how your mood has become more tranquil. It is only a habit or convenience to stand, walk and sit with the hands facing down or away from the direction you are facing. As such, like any habit, you can change and develop a new way to hold your hands when they are not busy being used. Reduces the chance of abnormal joint wear that could result in back pain, arthritis and slipped discs. Prevents the spinal vertebrae from becoming locked or fixed in abnormal positions. Prevents general fatigue because less energy is wasted as postural muscles are used more efficiently, and not stressed. Prevents strain injury from fatigue and overuse of tendons and ligaments. Prevents backache, joint pain, vague dull body aches, and muscular pain. Contributes to a more attractive appearance and an aura of greater self-confidence when the head is held high, the chest raised with the shoulders held back. Learn more how to improve posture, reduce back pain and get back your energy, click here: 18 ways to get good posture and have less back pain now.